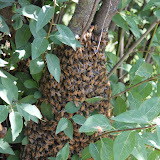 Went in to check hives again today and opened up the first hive... Here is the results; plenty of bees, very obvious signs of a queen and 20 frames that look just like the one in the picture. If they weren't fully capped like the one in the picture, they were certainly close. We are discussing entering a frame or two into the fair. If we win then we can say that we have award winning honey. So about the monster swarm... Well i am happy to report that they are doing great! I checked on them today and what a wonderful site to see what the girls do when you mess up and forget to put 3 frames into their respective slots in the hive. Well these good little girls went an pulled down three beautiful combs from the inner cover. It was amazing, beautiful straight, stark white comb. Good girls! I never would have imagined them using the inner cover as a top bar. How funnny, and no, I dont expect to get that lucky ever again. they could have just as easily put in some nice cross comb for me. I was able to carefully cut it off the inner cover and then gently put it into some deep frames that I had on hand. Wired it in and I think that all is now good. they should re attach it to the true top bar and no one will ever know. As sheer luck would have it, as I was getting ready to cut the last piece of comb, I thought to myself... I might want to get the bees off just in case this one has the queen. It had the most bees on it and I thought it sure would be difficult to spot her with the light fading and I really didn't want to kill her. Plus I hadn't sen her on any of the other frames I examined or the two frames that I had already cut off. 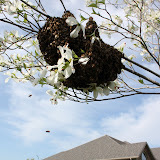 Well as I picked up the top cover to get ready to brush the bees off guess what... I just happened to glance right at her. Wow, total fluke, but there she was. So I snapped a couple of pictures of her. If you look you can see she is just left of center in the picture at right. So no question now she didn't get killed with the fire extinguisher.